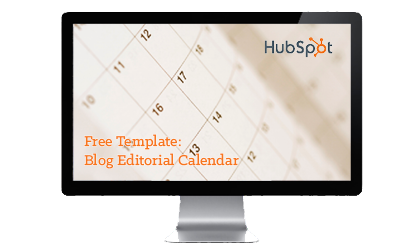 Download HubSpot's free blog editorial calendar, used by over 140,000 marketers worldwide. 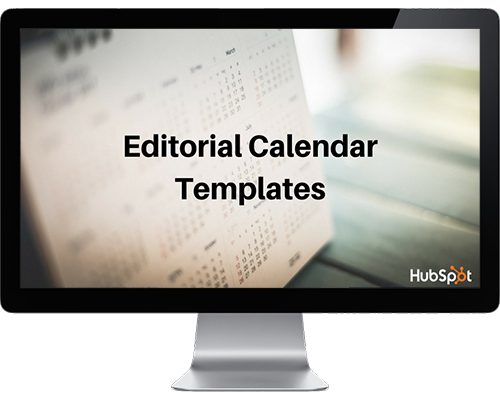 Plan and optimize your marketing content with these free calendar templates. Often, the greatest challenge of blogging is not the actual writing. It’s all the other related tasks, let it be brainstorming topics, targeting the right readers, or optimizing posts with the best keywords and calls-to-action. Yet, each of these steps are necessary to be organized, focused, and ultimately, successful. This is where our new Blog Editorial Calendar Templates come in handy. In this offer, we’ve created three different formats for your blog editorial calendar (for Excel, Google Sheets, and Google Calendar), as well as our Social Media Calendar Templates and Content Editorial Calendar Templates offers. To help you speed up the implementation of your new blog editorial calendar, we’ve also written out instructions for each template and gathered some expert blog management tips. With a little bit of customization, your editorial calendar will be running smoothly, leaving you more time to focus on the quality of your content. Often, the greatest challenge of content creation is not the actual writing. It’s all the other related tasks – brainstorming topics, targeting the right readers, or optimizing posts with the best keywords and calls-to-action. Yet, each of these steps are necessary to be organized, focused, and ultimately, successful. This is where our editorial calendar templates come in handy. One of the most frequent questions we get from aspiring and current inbound marketers is, "How do you manage all of that content?" When we tell them we use an editorial calendar, the next question is often, "Oh, how much does that cost?" The answer? Nothing. You can create perfectly robust editorial calendars using Google Sheets, Google Calendar, and Microsoft Excel without paying a dime. Instead of creating your own from scratch, check out the free content editorial calendars we've created for blogging, social media, and content campaigns. To help speed up your implementation of these templates, we’ve written out instructions for one and gathered some additional content management tips. With a little bit of customization, your editorial calendars will be running smoothly, leaving you more time to focus on the quality and reach of your content. Let start with what exactly an editorial calendar is. An editorial calendar is a calendar marketers use to organize and categorize the content they plan to publish in the future. Marketers use editorial calendars to organize and categorize all different parts of their marketing: their blog, their social media profiles, and their marketing campaigns. You can use editorial calendars to target the right readers and prospects, optimize your marketing content with the best keywords, and pair your content campaigns with a killer call-to-action. Looking for an editorial calendar integrated directly into your blogging, social media, and content marketing software? 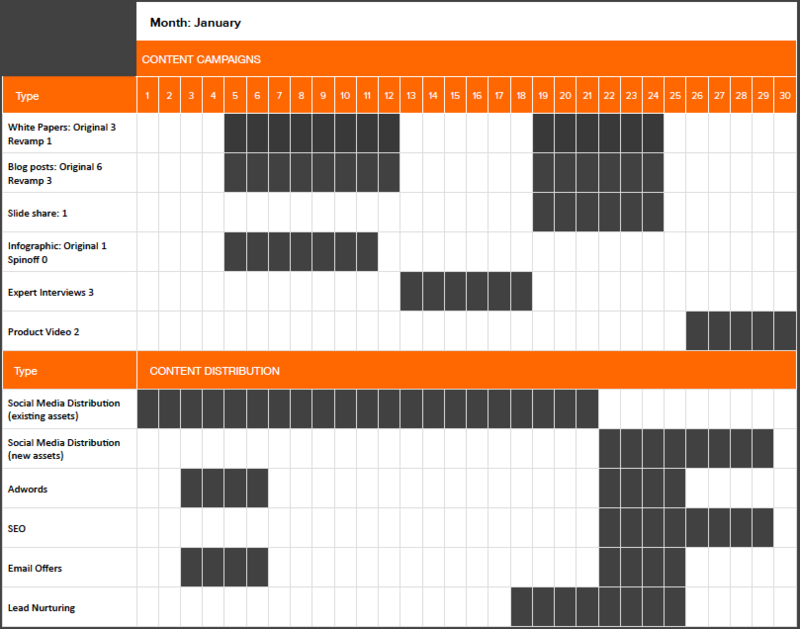 HubSpot's Calendar tool lets you coordinate your campaigns across your blog, landing pages, email, and social channels. 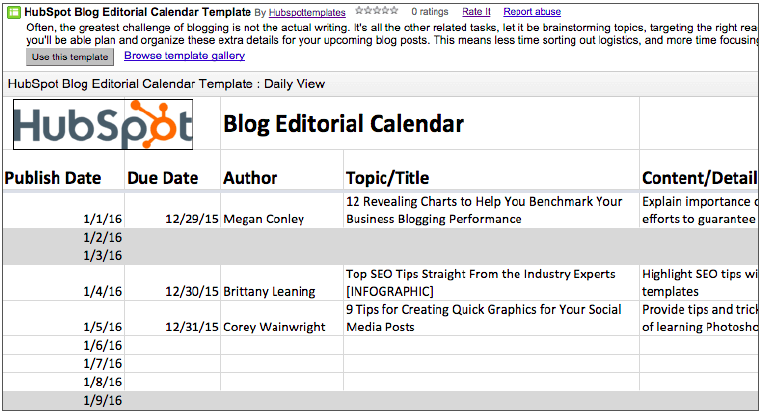 What is a Blog Editorial Calendar? Keep your blog posts and authors organized. Set your blog publishing frequency. Plan out your future blog content. Track your usage of keywords and calls-to-action. Balance your blog with a variety of topics and formats. Ensure all your blog posts are written on time and on target. Without a blog editorial calendar, you risk losing track of who's writing what and when it's getting published. A calendar will help you group all this information in one place, while also helping you strategize how you're optimizing your posts for search with keywords and for conversion with calls-to-action. We have three formats for blog editorial calendar templates: Google Sheets, Google Calendar, and Microsoft Excel. Why three? We recognize that content creation does not call for a one-size-fits-all solution. Content teams vary in size and management styles. While some may prefer a more centralized solution, other team structures require complete collaboration. Same goes for layout. Some prefer a list view, while others want a calendar layout. No matter your preference, we hope that out of these three templates, you’ll be able to find a solution that’s right for you. Now, click into the sections below for instructions to set up and customize these templates to create your very own editorial calendar in Google Sheets, Google Calendar, and/or Excel. Collaboration is a vital ingredient in running an efficient and scalable team, particularly when it comes to your procedure for managing and scheduling content. Unfortunately, Microsoft Word and Excel files saved locally make collaboration across a larger team challenging. Of course, you can email writers their assignments and due dates. But it never hurts to have an extra set of eyes on the schedule to make sure assignments are being evenly distributed and that posts vary in topic and format. This is where the Google Template version of your Blog Editorial Calendar comes in. 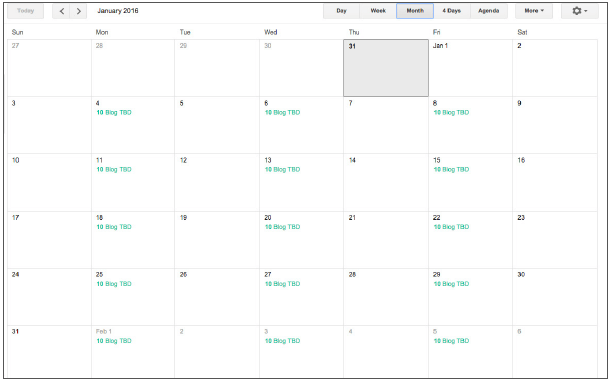 By storing your editorial calendar in Google, you’ll be able to collaborate on one of the most important planning documents for your team -- not to mention, the document will be protected against hard drive crashes, version control issues, and other unfortunate tech slip-ups. 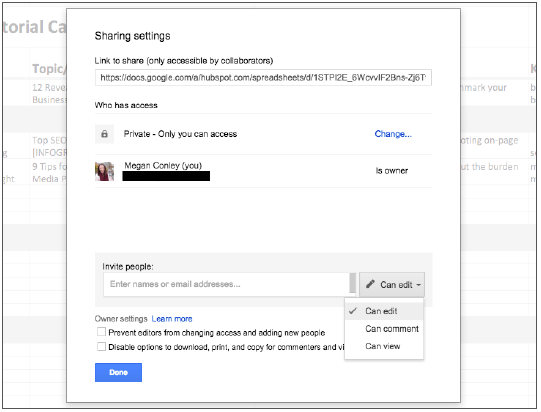 Follow the instructions below to learn how to set up the template and determine sharing settings across your team. Step 1: Get set up. To access this blog editorial calendar template, you’ll need a Google account. Luckily, Gmail accounts are free, easy to use, and most people have them nowadays. Once you’re ready and logged into your account, visit this link to the template in the Google Template Gallery. This feature allows you to import templates for Google Docs, Sheets, and Slides published by other users. To use this template in your own Google Drive, simply click the “Use this template” button in the upper-left corner. You’ll be directed to a Google Sheet in your own Drive with the template automatically imported and saved. Step 2: Customize and fill the calendar. Rename the document by clicking on the title at the top of the page. Then, continue making any customizations to the document as you please. Step 3: Set up sharing. Consider whom you want to share editing access of the calendar with, versus view-only access. Click “Advanced” to manage who can edit, view, or comment. When you’re finished, an email invite will be sent to each person with a link to the document. 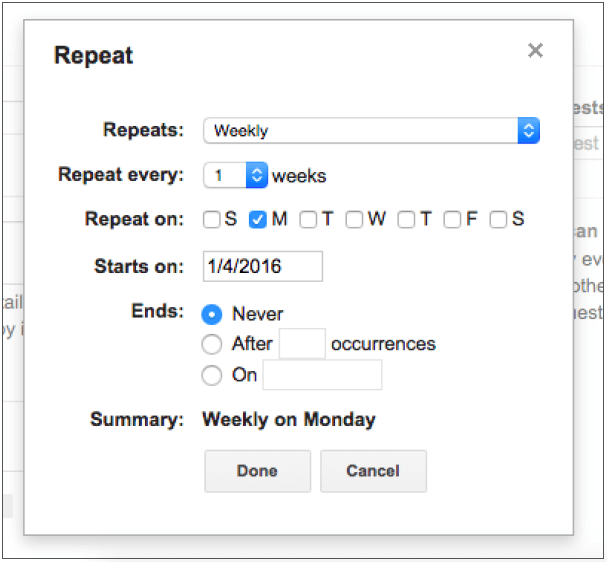 For many teams, Google Calendar is a tried-and-true editorial calendar solution. Why? Many companies use Gmail for their corporate email accounts, so each member of the team already has a hand in Google Apps (Calendar, specifically) all day. Also, this solution means there’s not the added roadblock of having to locate a file in Google Drive or on your laptop. The tab is already open. If you’re looking for a free and simple solution for your blog organization needs, try out the Google Calendar method. You’ll be able to collaborate across a larger team to decide when posts should be published and manage a balanced content calendar. And with all of the other things going on in your schedule -- social media campaigns, product launches, and even vacations -- this option provides additional insight into your scheduling decisions. Step 1: Download the CSV file. The following steps will teach you how to import the CSV file found in your offer zip file and customize the features in your Google Calendar. You’ll need a Google account to use this template. 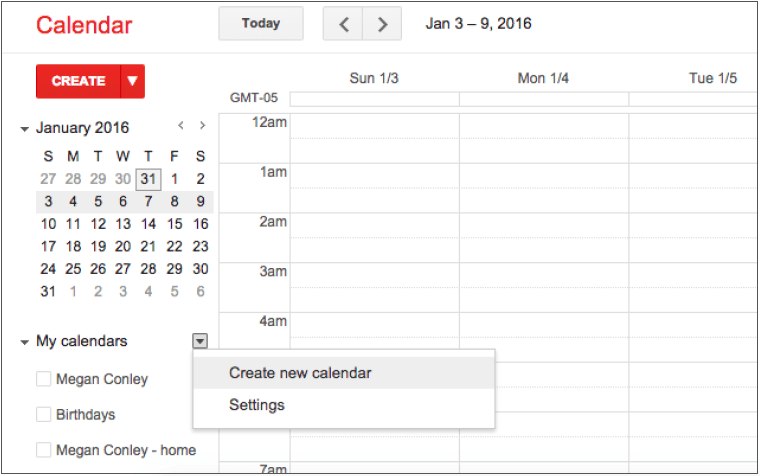 Once you’re logged in, go to your Google Calendar and select "Create new calendar" under the "My Calendars" dropdown menu. On the Calendar Details screen, fill in the Calendar Name and Description. For now, keep the sharing options blank. That way, people won’t receive an out-of-context email about an incomplete calendar. When you’re done filling in the details, click "Create Calendar." Step 3: Import the CSV file. Select "Import calendar" under the "Other Calendars" dropdown menu. Click "Choose File" and locate the CSV file entitled "Blog Editorial Calendar - Google Calendar" that was included in the zip file you downloaded in Step 1. For the Calendar option, be sure to choose the name of the calendar you just created from the dropdown menu. Then, click "Import." You should see an "Import calendar" dialog box telling you that seven events were successfully imported. Navigate to the next blank week. Be sure all of your other calendars are temporarily hidden by clicking the colored box to the left of the calendar name. Now, on your next week, you should just see one “Blog TBD” calendar event on each day from 10 a.m. to 11 a.m. This is the start of your calendar! Step 4: Determine your publishing schedule. Now is when you have to make some decisions about your blog publishing schedule. While the CSV file you imported accounted for a blog post every day, this doesn’t mean you need to publish seven days a week. Maybe you want to publish every Monday, Wednesday, and Friday. Perhaps just on Thursdays. Remember, the key to successful blogging is quality over quantity. Don’t overcommit to a blogging schedule if the quality of your content will take a hit. If you decide to decrease the number of days you want to publish, click on the calendar event of that day and select "Delete." 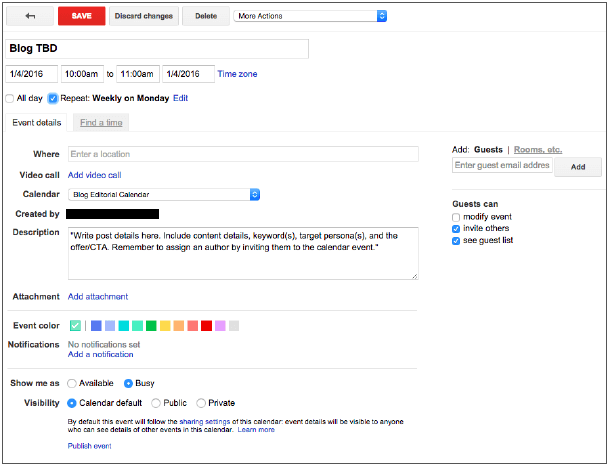 Even if you wanted to publish multiple times a day, updating this calendar is as easy as adding an event. Select a slot on your calendar to add another “Blog TBD” event and copy the default description from another one of the events you imported. Next, it’s time for some minor adjustments. Currently, the “Blog TBD” events are set for 10 a.m. Feel free to move these events to whatever time your blog publishes during the day. Curious about what time is best for you to publish a blog post? Check out this how-to blog post on using a Custom Google Analytics Report. 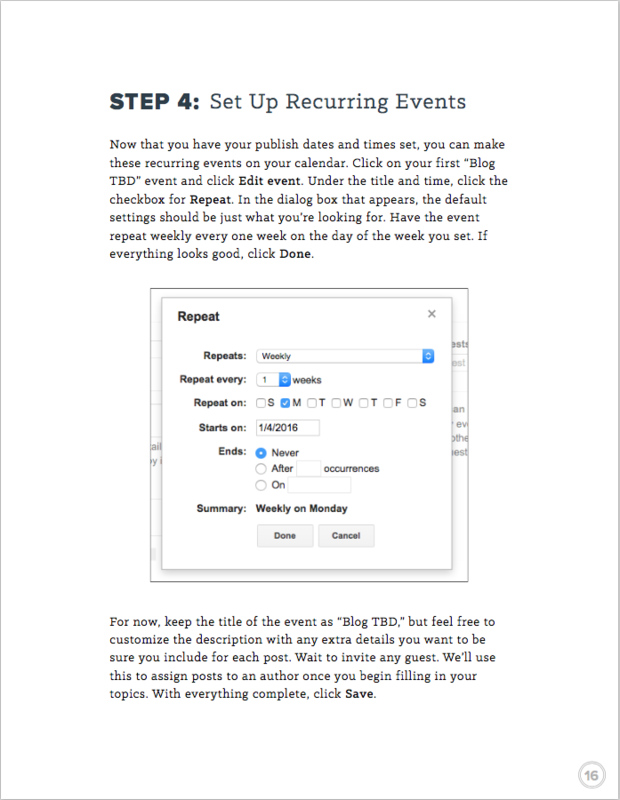 Step 5: Set up recurring events. Now that you have your publish dates and times set, you can make these recurring events on your calendar. 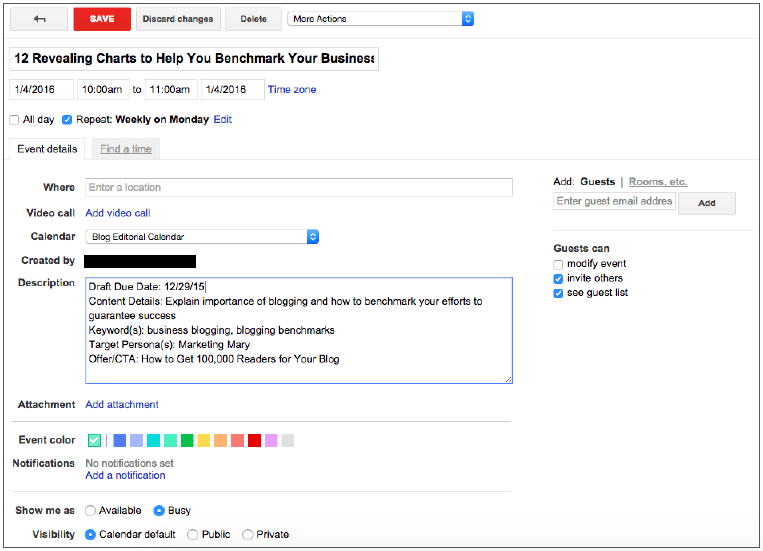 Click on your first "Blog TBD" event and click "Edit event." Under the title and time, click the checkbox for "Repeat." In the dialog box that appears, the default settings should be just what you’re looking for. Have the event repeat weekly every one week on the day of the week you set. If everything looks good, click "Done." For now, keep the title of the event as "Blog TBD," but feel free to customize the description with any extra details you want to be sure you include for each post. 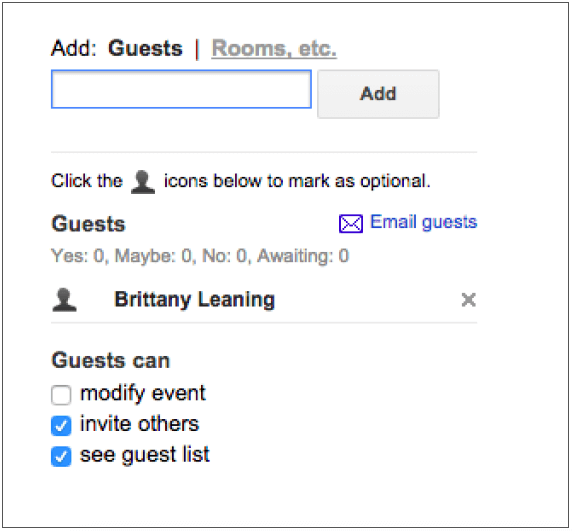 Wait to invite any guest. We’ll use this to assign posts to an author once you begin filling in your topics. With everything complete, click "Save." Repeat this step for each of the “Blog TBD” events during the week. When you flip to the month view, you should see that your events have repeated over the following weeks. Step 6: Fill your publishing slots. Now that your calendar is starting to look full, it’s time to actually fill your publishing slots. When you’re ready to assign a blog topic, click on the “Blog TBD” event on the day you want to publish and click Edit event. Replace “Blog TBD” with the title or working title of the post. Fill in the details, including a quick synopsis, the keywords you plan to target the post for, the target audience you’re trying to reach, and the offer or CTA you will direct the reader to at the end of the post. Finally, don’t forget a due date for the draft. Before you officially save your first post on your new editorial calendar, you need to assign it to an author. Here’s where the invite comes in. On the right side, enter the email address of the assigned author and click "Add." You’ll see their name appear under guests. Click "Save." Before Google Calendar will let you save the event, you’ll see a dialog box asking if you would like to change just this event or all of the events in the series. Select "Only this event." Repeat these steps to assign each blog topic today and in the future! Step 7: Set up sharing. Finally, it’s time to share your beautiful, new calendar with the world. Well, not the world. But at least your content team. Click the dropdown arrow next to the name of your calendar and select "Calendar settings." You’ll see a lot of options for customization, but for now, go straight to the "Share this Calendar" tab at the top. Now you’ll have a few more decision to make. If you have a corporate Google account, you may check the box next to "Share the calendar with others" and choose to make the calendar visible to everyone in your organization. This gives full transparency to your colleagues about what is getting published and when. 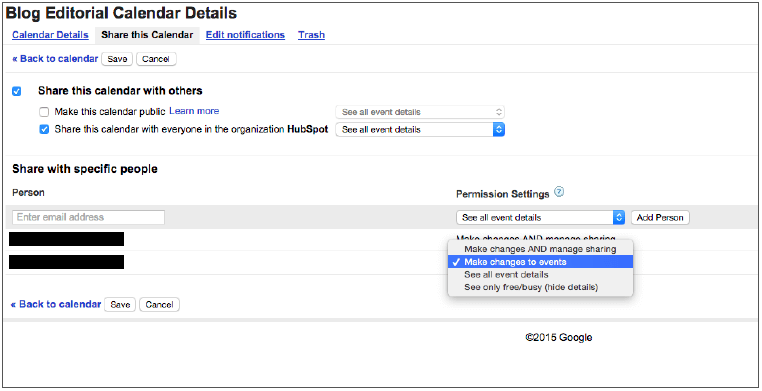 However, we suggest selecting "See all event details" from the dropdown menu, and not selecting "Make changes to events." With something as important as your blog editorial calendar, you don’t want too many cooks in the kitchen. Under the "Share with specific people" heading, enter the email addresses of those on your content team and decide if they have viewing, editing, or admin privileges. Save your updated settings. Assign colors to your post events. Are you a habitual highlighter and sticky note consumer? Good news here -- Google Calendar is perfect for those who live to color code. 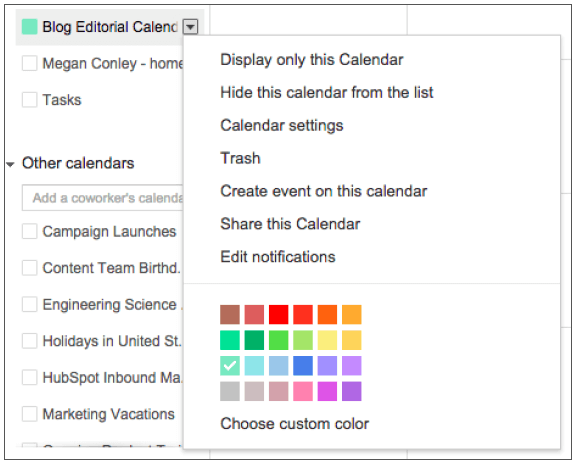 Make your editorial calendar more visual and efficient by assigning colors to your post events. Try assigning each author to a specific color to make sure the workload is balanced, or each blog post type to help ensure you keep your blog content diverse. Don’t let forgetfulness -- or worse, procrastination -- be your folly. 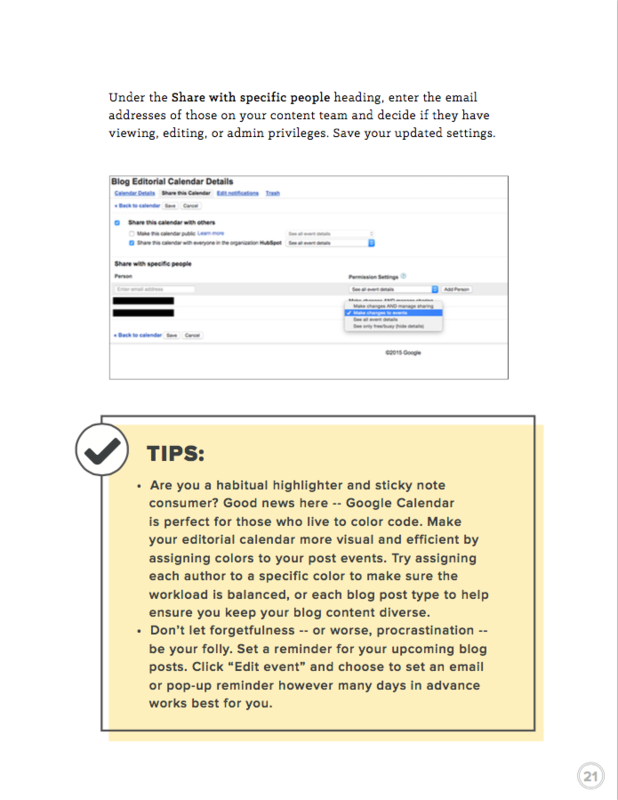 Set a reminder for your upcoming blog posts. Click "Edit event" and choose to set an email or pop-up reminder however many days in advance works best for you. Because Microsoft Excel documents are saved in one location, this option works best for small businesses in which the editorial calendar is managed and executed primarily by a single marketer. In a single sheet, you’ll be able to manage an entire year’s worth of content with ease. Follow the day-by-day layout to ensure your content is balanced in topic and format. Keep an eye on the due dates column to better manage writers and make your own editing time more efficient. Continue reading to learn how to set up your blog editorial calendar in Excel and prep each post idea for success. Step 1: Download our Excel file. 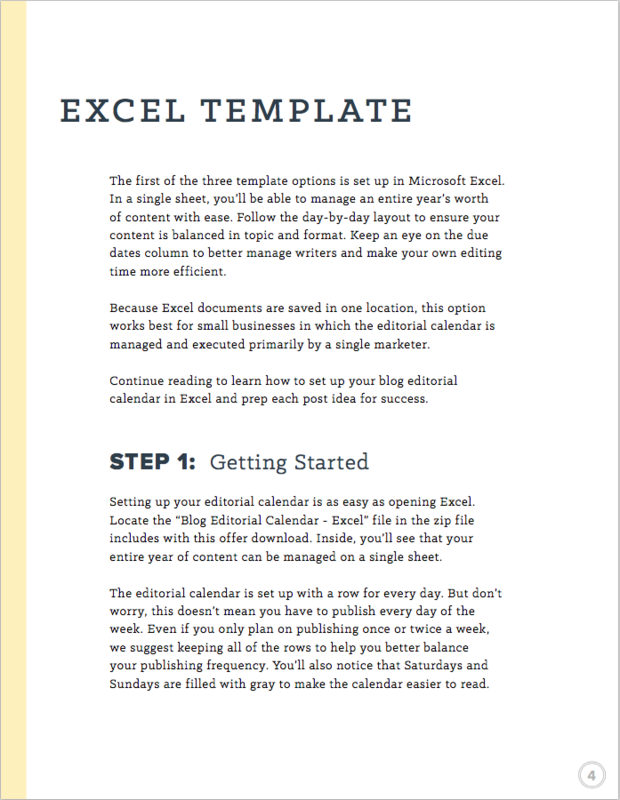 Once you've downloaded the template, setting up your editorial calendar is as easy as opening Excel. Locate the “Blog Editorial Calendar - Excel” file on your computer. Inside, you’ll see that your entire year of content can be managed on a single sheet. The editorial calendar is set up with a row for every day -- but don’t worry, this doesn’t mean you have to publish every day of the week. Even if you only plan on publishing once or twice a week, we suggest keeping all of the rows to help you better balance your publishing frequency. You’ll also notice that Saturdays and Sundays are filled with gray to make the calendar easier to read. Step 3: Follow the steps in the next section, "How to Manage Your Editorial Calendar." This will include adding a due date and author, as well as entering your keywords, target persona, and call-to-action -- all in their respective columns. HubSpot’s Blog App helps you rank on search engines and attract quality leads for your business. In fact, last year, businesses that used HubSpot’s software saw their traffic increase by more than 2.5 times. Step 1: Add a due date and author. As you begin filling in your calendar with your future blog posts, start with the due date and author columns. Assign due dates at least a few days in advance of your publishing date. Especially if you are starting out with new writers, leave a larger buffer so you have time to both edit the piece and provide the writer with feedback. Step 2: Add a title and content details. For your blog post title, make it actionable, clear, and intriguing. If you don’t have a title yet, don’t worry. Start with the general topic or working title. However, be sure to enter the full title once it’s nailed down. This will help you maintain a proper balance of different post types and subject matters. Don’t know what to blog about? Let HubSpot think of ideas for you. Check out the Blog Topic Generator to receive a week’s worth of relevant blog post titles in a matter of seconds. Once you’ve got your perfect post topic, come up with a working title to guide the creation of your content. For a simple formula for writing amazing titles and headlines, check out this blog post. Write out a general synopsis under the Content/Details header. This will help the writer understand the assignment and maintain a connection between the title and the final content of the post. As you pass along your content to the social media and email teams for promotion, this section will also clarify the focus of the post. Step 3: Enter your keywords, target persona, and call-to-action. Step 3: Enter your keywords, target persona, and call-to-action. It’s easy to overlook SEO when your main focus is content creation. Use the keywords column in the template to list search terms your company is trying to rank for in each blog post. This will keep you accountable to blogging about topics that your target audience is searching for. Speaking of which, brush up on your buyer personas and enter that target reader into your editorial calendar. Don't have buyer personas for your business yet? Having a deep understanding of your buyer persona(s) is critical to driving content creation (and really anything that relates to customer acquisition and retention). 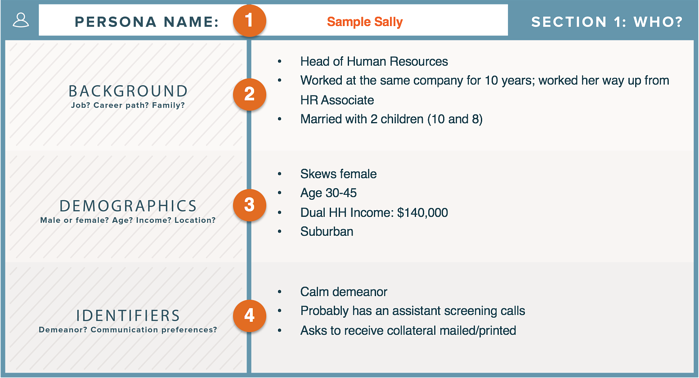 Before you spend time and money on research, use our free buyer persona template to create your personas and share them with the rest of your company. Each piece of content you create should lead your target audience into the next stage of the buyer’s journey. That’s why each blog post you publish should include a call-to-action (CTA) for a lead-generating offer that visitors must fill out a form to obtain. In the final column of the spreadsheet, include a link to your CTA to keep you organized and on-track with your goals. 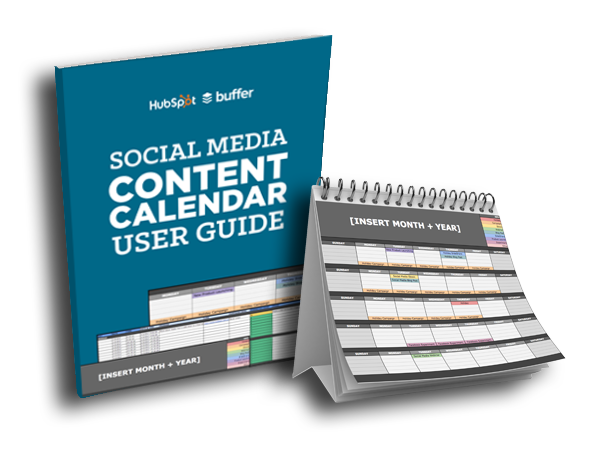 A social media editorial calendar is a calendar that lets you organize your social media activities far in advance to make your social media marketing more manageable. It'll help you plan which content to share on each of your social media accounts -- and when. Plan out posts weeks or months in advance, which frees up working hours to strategize for the future. Keep track of exactly how to format your content for every social network, including Facebook, Twitter, Instagram, LinkedIn, Google+, and Pinterest. Plan for each social network to customize posts instead of spamming all platforms with the same message. Keep track of your larger social media campaigns on a monthly basis. Coordinate better with other stakeholders. Track performance and plan for future posts. Without a calendar, social media marketers are publishing content into the void and are unable to track big-picture and past performance. With a calendar, marketers can look back and analyze which content performed best so they can adjust their strategy accordingly. Social media marketers should take the time to craft custom messages for each network, and doing this in advance will save time throughout the week and ensure that you’re being thoughtful and intentional when you do post. Without a social media editorial calendar, you'll risk publishing content into the void without being able to track posting frequency, post type, and how your posts perform. We've created an easy-to-use Excel template to help you plan your social media content on Facebook, Twitter, Instagram, LinkedIn, Google+, and Pinterest, all while providing helpful tips and tricks along the way. Click the button below to download your own social media editorial template in Excel. Use the Monthly Planning Calendar Tab to get a bird’s-eye view of what’s coming down their content pipeline in a given month. A content editorial calendar is a calendar that helps you put together an effective content marketing plan for either your business or those of your clients. As marketers invest more and more in content (because, well, great content helps fuel successful inbound marketing campaigns), content planning will undoubtedly have a major impact on the success of both your inbound marketing campaigns and the effectiveness of your content marketing overall. Analyze the strengths and waeknesses of your current content marketing efforts. Plan out your various content campaigns and how you will promote them. Balance your campaigns with a variety of topics and formats. Content campaigns have a whole lot of moving parts, and without a content editorial calendar, you risk losing track of all the different aspects of your campaigns. A calendar will help you group all this information in one place, set deadlines, and keep people accountable. 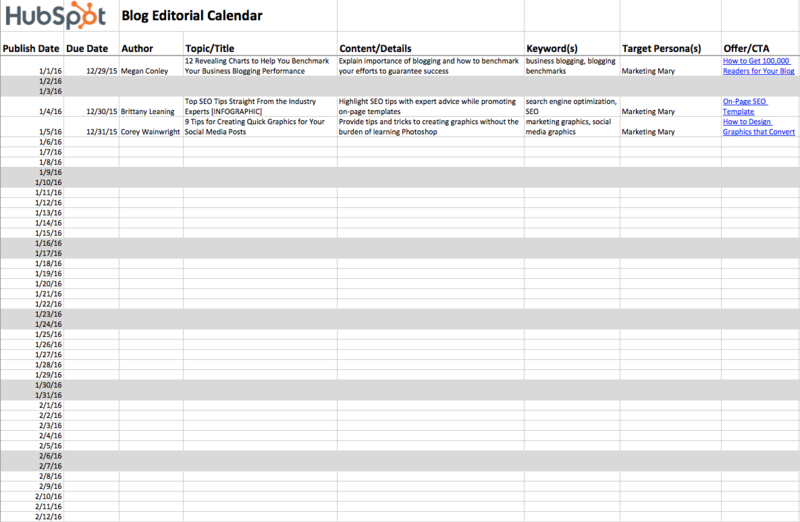 Click the button below to download your own, customizable content editorial calendar template. Using this template, you'll be able to create an actionable plan based upon the strengths and weaknesses you’ve identified from your current efforts. 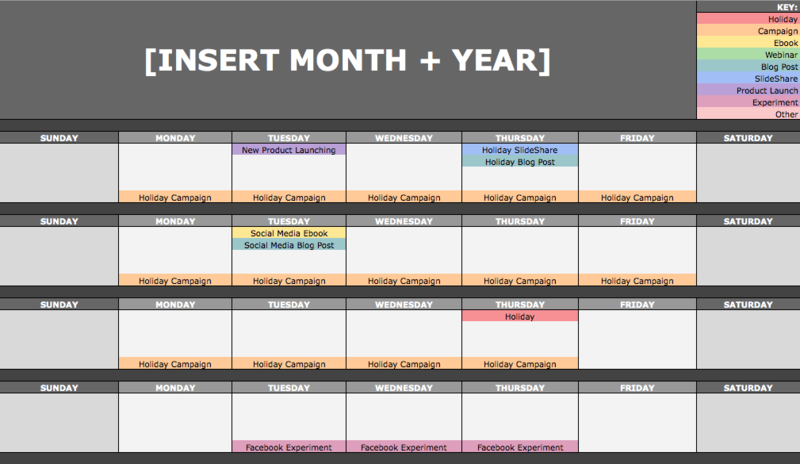 You can also make a one-month timeline for your content campaigns and your content distribution plans, i.e. how you plan to promote those campaigns. In addition, you'll learn how to do a SWOT analysis of your current content marketing efforts, which will help you create a plan of action based not on what you’re interested in doing or on your gut-feel, but what you need to do given the situation in the marketplace. That analysis will help you develop a high-level action plan of the most important tasks that will impact the success of your content marketing. Ready to streamline your content planning? Download all the templates below to plan and optimize your blog content, social media posts, and content campaigns. Plan and optimize your blogging with these templates. Manage and plan your social media content with this template. 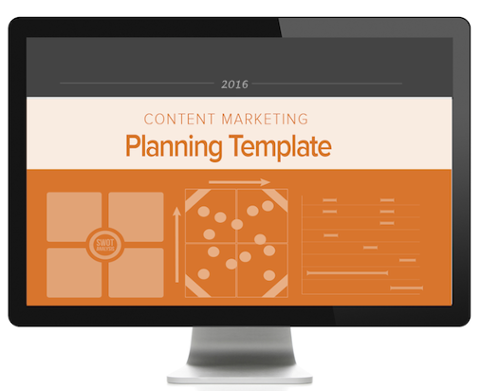 Manage and plan your content campaigns with this template.